Growing up, if I’ve heard this once, I’ve heard it a hundred times, “a late ‘thank you’ note is still better than no ‘thank you’ note at all”. This might have been true then, but in a world of instant communication, it’s hardly acceptable anymore. The ‘thank you’ email is often the automated communication that gets the least attention from email marketers and this is because it is so often incorporated into other messaging and email communications. But, saying “thank you” properly and timeously can help increase your email engagement considerably, as well as improve the retention of your loyal customers. When should we say, “thank you”? Order confirmations and eReceipts have the advantage of having some of the highest open rates. 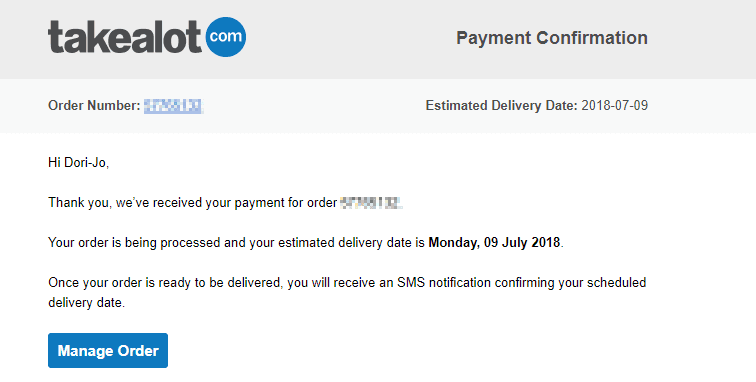 The reason for this, is that customers who have just made an online purchase seek the peace of mind that this email confirmation brings. This provides us with a great opportunity to thank customers, not only for their purchase, but also their continued support. Brands today expect a lot from their customers. Not only do we ask customers to shop now, we are constantly asking them to ‘tell their friends’ about us, to share ‘this message’ on Facebook or Twitter and often, after a purchase, we ask customers to take a quick survey to ‘tell us how we did’. 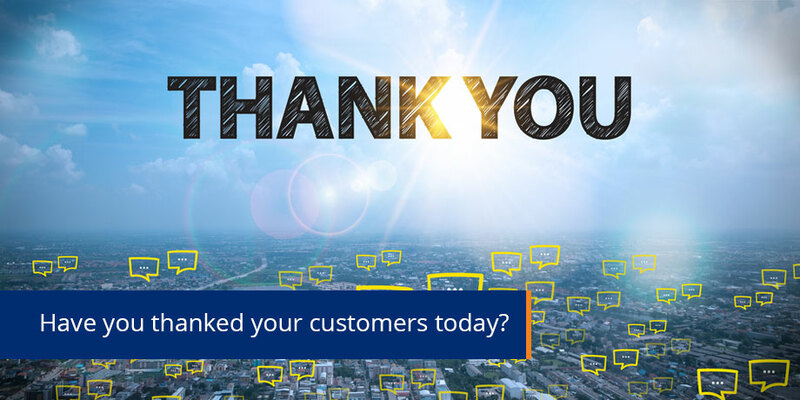 How often do you thank your customers for the time that they have put into making your brand better? 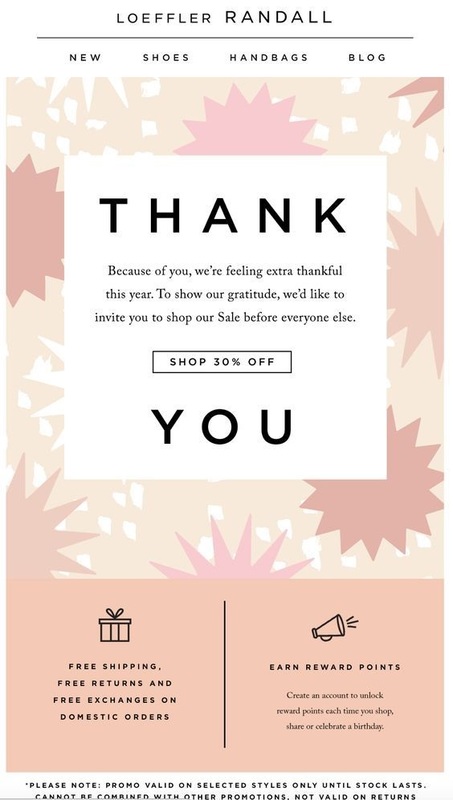 Sending a ‘thank you’ email, a ‘thank you’ voucher or discount, goes along way toward ensuring that these customers feel valued. We send birthday and anniversary emails to commemorate and celebrate big days, but sometimes a “thank you”, just acknowledging a customer, is a really great way to tell them that they are appreciated. 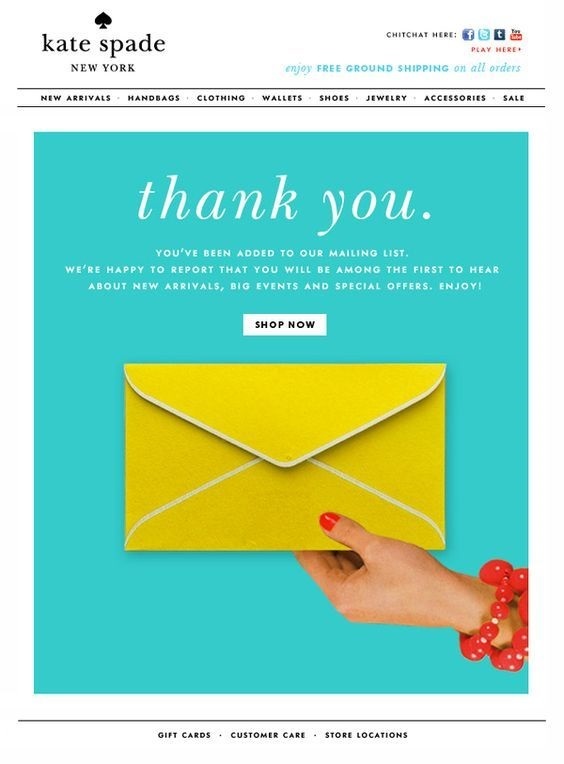 This type of ‘thank you’ email can also incorporate additional information that shows the customer that you care. For example, letting them be the first to know about a big sale or inviting them to an exclusive event, is a great way to say thanks and ultimately build a strong relationship. This one is especially important for loyalty programs, where a lot of time is spent educating customers on how they should interact with us and make the most out of our loyalty program. We tell them, for example, how to move up a level or earn more points, but we sometimes forget that moving up a level means a bigger commitment to our program. Therefore, a customer’s achievement in this instance, should not only be met with a message of congratulations, but also a: “thanks for your loyalty and investment in our program or brand”. Email has the advantage of being highly measurable. This enables you to track who opens and engages with your emails. 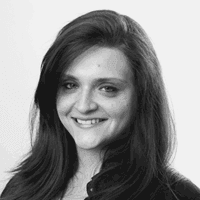 Why not send your loyal readers of your email communications, a ‘thank you’ email? And in it, you could ask them if there is any additional content they would like to receive from you, or if they have a friend that would also be interested in receiving your email communications. While we have been speaking about adding value to existing customers, you cannot forget to thank new customers for signing up to receive your email communications.This email is often confused with the welcome email. While It does indeed share many similarities to that of a welcome email, there is one big difference – this email is sent to people who may not yet be customers – they are just window shopping. They may have signed up to receive a newsletter or to find out more about your product and/or service. Thanking them for signing up and introducing your brand may be exactly the push they need to become a customer.